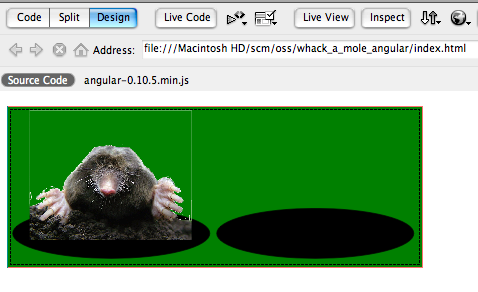 Hmm, the mole image has some lasso artifacts after I reappropriated it from wikipedia. Damn you CorelPaint! The thing I want folks to really grok right now, is that there are two images in the source apparently side by side within each of the TD elements. Specifically “mole up” and “mole down”. It is Angular that’s making one one of the two show at any one moment in time. Gecko and Webkit are fast enough to not make it apparent that there is momentarily two or none of the images visible for a cell. Perhaps Angular has no such tweening state, and is even in charge of the browser repaints. The ng:click stuff is where the model gets changed - or rather the “up” becomes “down” or vice versa. 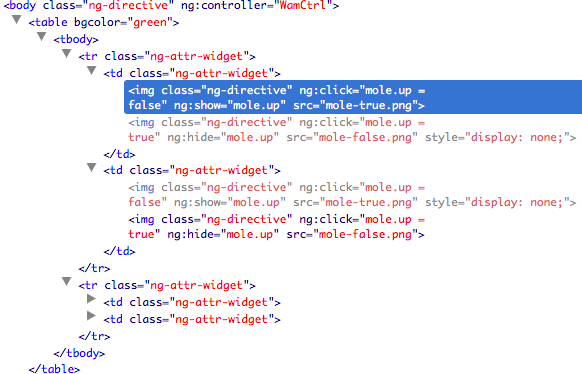 ng:click is attachable to any meaningful element of course. Yes that’s the mole both apparently **alive** and **dead** at the same time. HTML’s rowspan might be the Angular triggered UI trick to accommodate that, by the ng:click would trigger an @’expanded = true’@ model change for the fruit in question. As retrieved from the database the fruit never had a @’expanded = false’@ node, let alone @’expanded = true’@, but that does not matter as in the worse case scenario, your could ignore such properties when attempting to write the fruits back to the database (if they were editable in-situ). 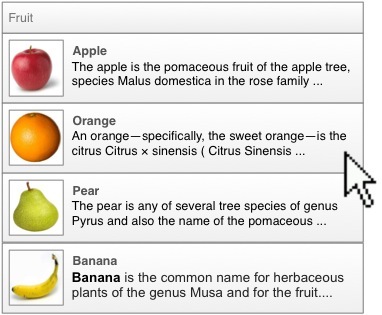 Your original JSON document to support the list of fruit might only have enough text to support the collapsed list of fruit. 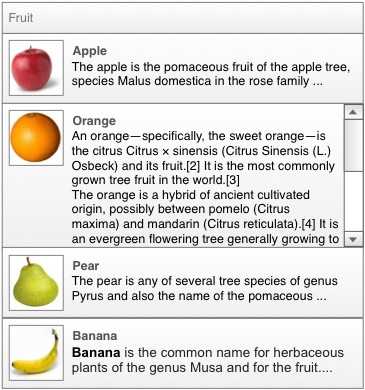 If that’s the case, you’d do an AJAX wire call to get the expanded fruit description, and populate an ‘expandedFruit’ object outside the ‘fruits’ model. 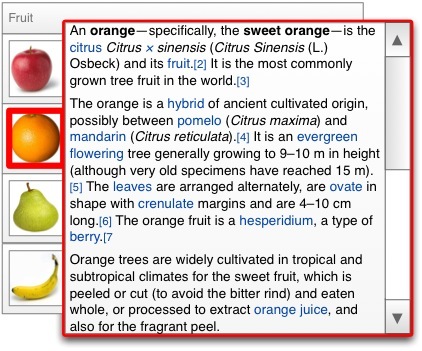 Only one fruit is expanded at a time, so it could easily be a single field. Judicious use of ng:show again will make the right control of two show within the <td> .. </td> elements. The same backend model, AJAX fetch, and expandedText field, but a different view still driven by ng:show. You could refactor from one design to the other. Indeed the UX person could do so without developer help. All of a sudden, web apps became simpler to make (again).